The top lawyer in the White House is "co-operating extensively" with the Russia inquiry into election meddling, the New York Times reports. Donald McGahn has spent 30 hours sharing detailed accounts of episodes at the heart of the probe, it says. Mr Mueller is investigating possible collusion between Russia and Mr Trump's team in the 2016 US election. The president denies any collusion, and has repeatedly called the Mueller probe "a witch hunt". Russia also denies claims it interfered in the polls two years ago, which saw Donald Trump defeat Democratic rival Hillary Clinton. What's in the New York Times report? 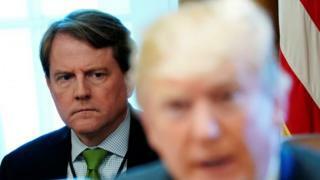 Citing a dozen current and former White House officials, the paper says White House counsel Donald McGahn gave at least three voluntary interviews to investigators totalling 30 hours over a nine-month period. During this time, he gave "a clear view of the president's most intimate moments with his lawyer", sharing information the paper says investigators would not have previously known about. It said he had recounted Mr Trump's comments and actions "during the firing of the FBI director James Comey, and Mr Trump's obsession with putting a loyalist in charge of the inquiry, including his repeated urging of Attorney General Jeff Sessions to claim oversight of it". As well as collusion, the special counsel is scrutinising whether there were any attempts by the president to obstruct justice. Just last month, Mr Trump demanded Mr Sessions fire Robert Mueller and end the probe "right now". A source close to the probe told Reuters they did not believe Mr McGahn had provided any incriminating information. After the report was released, President Trump confirmed in a tweet that he had allowed Mr McGahn and other White House staff "to fully co-operate with the special counsel". President Trump launched a fresh attack on the newspaper on Sunday, describing its report as "a fake piece" for implying Mr McGahn had incriminating information to share. What is the Russia investigation? Special counsel Robert Mueller is investigating whether President Trump's campaign team colluded with Russia to influence the outcome of the presidential election. In 2016, US intelligence agencies concluded that Russia had used a state-authorised campaign of cyber attacks and fake news stories planted on social media in an attempt to turn the election against Hillary Clinton. Thirty-two people have now been indicted, including four members of Mr Trump's campaign team and 25 Russians. The president's former campaign manager, Paul Manafort, is the first person to go on trial as a result of Mr Mueller's investigation. However, the charges are not related to the US election but instead to tax evasion and money-laundering stemming from his political consultancy work in Ukraine. The jury in his case has retired to consider a verdict.